Fantasy Mosaics 30: Camping Trip is rated 3.9 out of 5 by 10. Rated 5 out of 5 by Homeimps from Good Mosaic! These Fantasy Mosaics puzzles never used to run on my pc, even after I bought a new one. Good to see they now run and this is a really good one. So far, in the demo, there was at least one level that really made me work for it, and no guessing, which in my opinion, ruins this kind of game. I took off a star for Visual/Sound Quality only because the colors of the numbers don't really match the color being worked on, for example, the green numbers on one level are almost turquoise, which was somewhat confusing as there was also a turquoise set in that level. Looking forward to the next one! Rated 5 out of 5 by DRAGONWYN from One of the few game series I buy without needing the trial hour to see if I like it. Didn't even download the trial, Just hit the buy button and started playing. Love the series, haven't found another grid game that compares. Some are good but I'll keep buying these without worrying if I wasted my money. Keep'm coming. Rated 5 out of 5 by grandmacathy from The Penguins do it again I love these games. I like the addition of colors, and this game is no different. I was kind of hoping for another type of challenge but I understand there are only so many new things you can do with the game without losing the purpose of the grid itself. The grid itself is entertaining to me! Seeing another Fantasy Mosaic game warms my heart. I really enjoy the series. If this is the first time playing this type of game, try it before you buy it like another person has recommended. If you like the Fantasy Mosaic series, try some of the other grid/mosaic games. There are some that have been out for years that are still my favorites! Rated 5 out of 5 by MrsBen from FANTASY MOSAICS 30...WHAT A HAPPY MONDAY MORNING GIFT!! 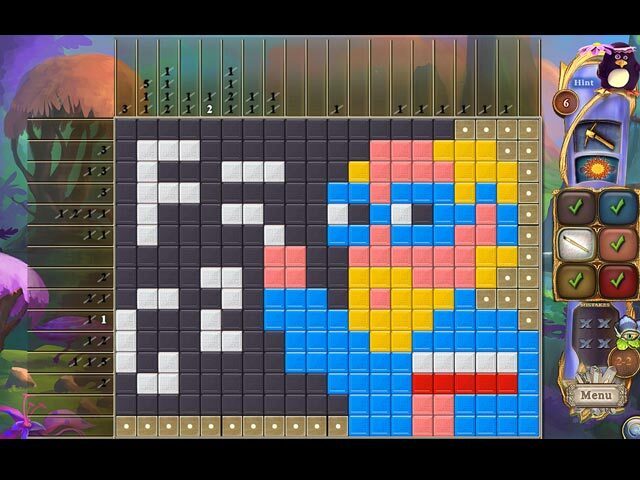 I had just about decided 29 was it, so I was thrilled to see a new "Fantasy Mosaics" game this morning. The graphics are delightful and the game is of the usual great quality. I can't add any technical stuff to what's already been said, so I will just invite all you BFG fish to go camping with the Penguin Family and me! Looks like another great adventure for sure!! Rated 5 out of 5 by biscuitsmama from A CAMPING TRIP WITH A BIT MORE CHALLENGE I will always love Fantasy Mosaics that was one of the first really excellent mosaic type games to hit the market after World Mosaics disappeared. As another reviewer pointed out the first several games in the series were monochrome but the later incarnations of the game picked up a wonderful palette of brilliant colors making them far more appealing than the existing mosaic games that were available. 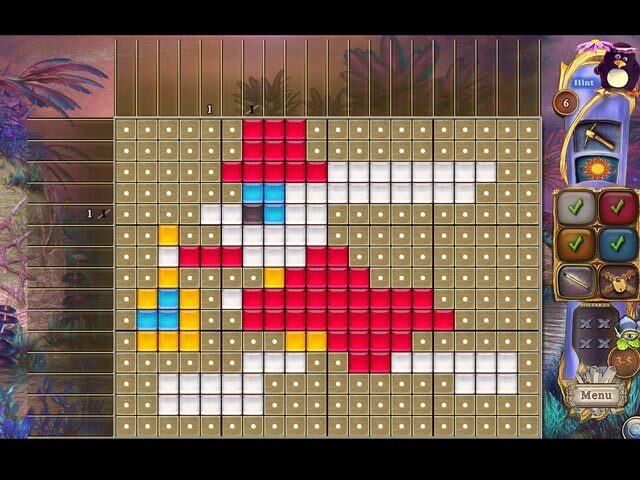 In fact, Fantasy Mosaics was the first game of this type to add a wide variety of not only colors but various tile styles as well that made games far more enjoyable. 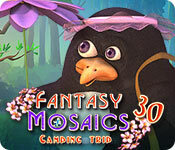 In Fantasy Mosaics 30 the much loved penguin family is off on a camping trip and will undoubtedly pick up some friends along the way as their adventure progresses. Even though some might consider the FM games to be fairly easy, in my experience the past few games have been a bit more difficult and I definitely had a much more difficult time determining where to put the first few tiles. As much as I hate to admit it, I did need to use a hint when switching between the two available colors still left me trying to figure out where to place the beginning tiles. Making the games a bit harder finally adds the layer of difficulty many gamers have requested. My favorite feature in all of the FM games is that the grids are larger and the squares are easy to see. I also appreciate the contrast where the grid indicates the number of tiles to be filled. In other mosaic games I often find it very difficult to determine the number of squares that must be completed for a specific color. Although there are some other great mosaic games available here at BFG, Fantasy Mosaics will always be at the top of my list. I own all 30 games in the series and as long as the developer brings them my way my gaming library will continue to grow. Pennmom has submitted a comprehensive review about all the features to expect in the game so I am not going to duplicate her efforts so will close by saying that I love this game. As always, please try the demo before you buy to see if you will enjoy Fantasy Mosaics. Happy gaming! Rated 4 out of 5 by Calopsitta from No real news yet..... And so we reach episode number 30 in the never ending Penguins saga. I will not be long in this review. Everything works perfectly as usual, but since the introduction of secret colors a few chapters ago, nothing has changed. And even secret colors I do not find that exciting, as grids have grown easier to balance the very relative difficulty. The only thing that can be said about this episode is that there is a somewhat new palette of colors, very bright and very different from each other, (which can be a good thing if you, like me, are tired of squinting your eyes at similar games to tell the tiles apart from grey, to dark grey, to not-so-dark-grey), and that, possibly because we have been training for the last 29 chapters, I find grids in this game to be on the easy side. Strictly logical as always. So, if you have been waiting for more penguins.... here you go! If you, like me, find it difficult to remember all the grids from the previous 29... just play one of those you have already bought! Rated 3 out of 5 by BearCreekStables from Puzzle Game I did play the demo for fun. I stopped buying with 28. They are enjoyable but after #30 there is no real change. I remember the penguins had a wedding theme recently and I thought they would appear at the end. NO. I also find the puzzles way to easy. I have not used a hint/axe/sun since #5. Rated 1 out of 5 by k9obsessed from Same stuff, different day......... I started playing the demo version and thought I already had this game. Turns out, it's just like all the other FMs over that past years. The game play is the same; there might be different colors, but there's no difference between this and the past 15 versions. How much longer will Match Games keep pushing these puzzles without offering any new features? At least make them more challenging with larger grids. My advice is to re-play any of the last 15 versions and save your money. Rated 1 out of 5 by CyndiLouWho2 from Hopefully they'll stop at 30 I played FM Camping Trip for about ten minutes and that was enough for me. There are no new power-ups, it's the same ice pick and sun. There's still no story and there are no innovative additions such as puzzles or mini games to break up the eye strain of grid solving. And after thirty tries, one would think the graphics would HAVE to improve, but they have not. 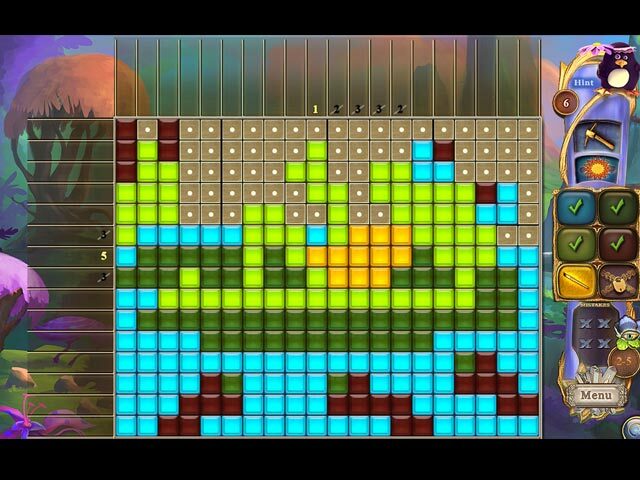 There are other mosaic or griddler games out there that offer so much more and that truly deserve five star ratings. If you've played or purchased the last twenty versions of Fantasy Mosaics, then re-play one of those and pass on this one. How people can give five star ratings to the same game re-hashed thirty times is beyond my comprehension.